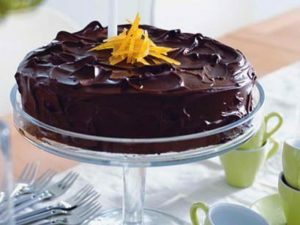 This super moist Orange Chocolate Cake is the perfect treat for those sudden sweet chocolate cravings or impromptu parties. The tangy flavor of orange from the marmalade, orange zest and juice compliment the bitter sweetness of the dark chocolate ganache frosting. Best of all, it is very easy to prepare and is ready in a little over an hour! Here is an easy dessert recipe for Orange Chocolate Cake. Pre-heat oven at 180C. Lightly grease and line cake pan with parchment paper. Beat butter and sugar in a large bowl until smooth and creamy. Add the eggs and beat again until frothy. Add the marmalade and beat again, just to combine. In another large bowl, sift together the flour, baking powder, and cocoa. Gently fold into the egg mixture using light movements. Pour batter into prepared cake tin and bake for about 45 minutes or until a tester inserted in the center comes out clean. Cool cake in the pap for at least 10 minutes before transfering into a rack to cool completely. While waiting for the cake to bake, melt the dark chocolate in a microwave or on a double boiler. Add the cream and and stir to obtain a smooth and glossy ganache. Pour ganache over the cooled cake and it drip along the sides of the cake. Top with candied orange zest (optional). Serve a slice of Orange Chocolate Cake with a dollop of whipped cream if desired.